Is IT the Most Connected Department in an Organisation? In large companies, it’s common for separate departments to maintain a level of independence and distance from each other, as they get on with their own responsibilities. Everyone this is, apart from the IT department of course. No matter how senior your role or the nature of your job, pretty much everyone in an organisation needs IT at some point or another. So could this make the IT staff the most connected employees in the company? Jive Software describe IT as being the Kevin Bacon of any organisation, as they are connected to pretty much everyone! 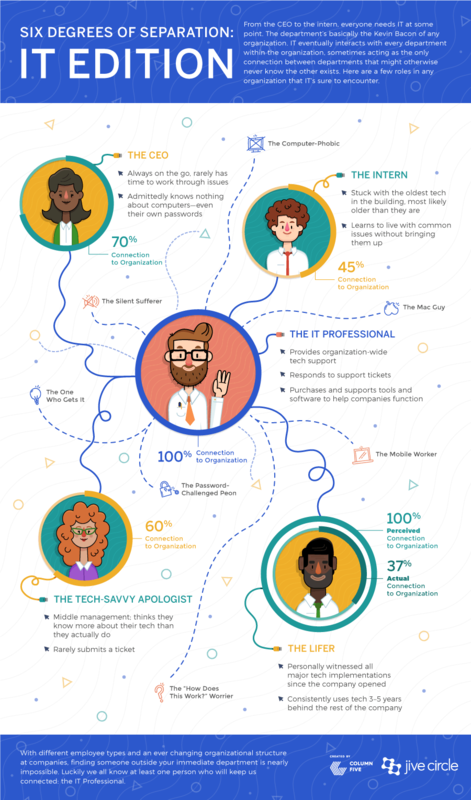 They’ve put together this infographic looking at all of the different roles that the IT staff will encounter on a regular basis. They provide tech support throughout the whole organisation. They respond to support tickets. They are connected to 100% of the company. The CEO is always on the go, so they rarely have time to work through tech issues. They will admit that they do not know much about computers – including their own passwords sometimes! They are connected to 70% of the company. They are usually lumbered with the oldest, most out of date technology in the building. They have to learn to put up with common issues, without complaint. They are connected to 45% of the company. They’re one of the most long-standing members of staff, so they have witnessed the introduction of all major tech implementations in the company. However they will only adopt the new technology around 3-5 years after the rest of the company, due to routine and being stuck in old ways. They perceive themselves to be connected to 100% of the company, however are realistically only connected to 37%. They think they know they know more about tech than they really do. They will rarely ask for IT help, even when it is necessary. They are connected to 60% of the company. Hates all technology and has no idea how to use it. The idea of new software fills them with dread. Makes life very difficult for the IT department, as they are never in the building. Insists on creating a new cryptic password for every single account without making note of them, which then leads to being locked out pretty much every day. They are most likely having an internal rage every time their computer crashes, but they won’t ever ask for help or inform the IT dept about the issue.